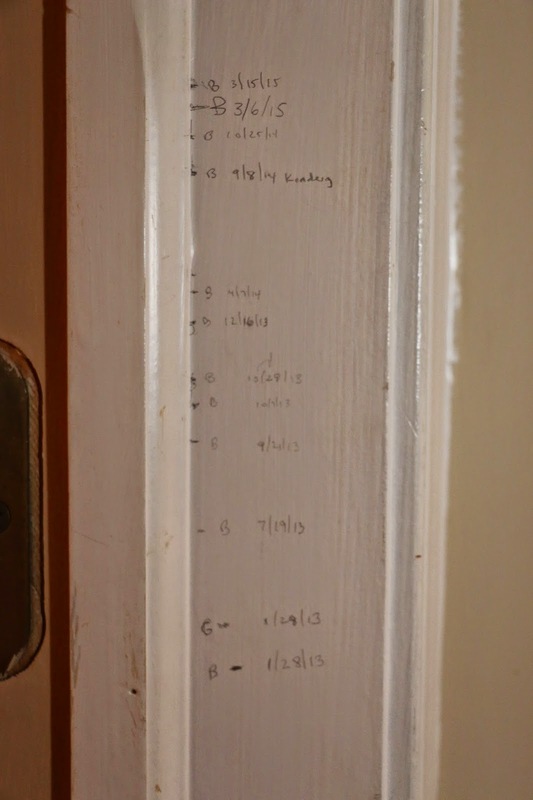 We created a special spot to measure the boys - on the door jamb leading down to our basement. Brian loves to watch his growth and gets very excited when he moves up a notch! In hindsight, we wish we had started doing this sooner. We could have watched Gavin and Brian racing to the top together. 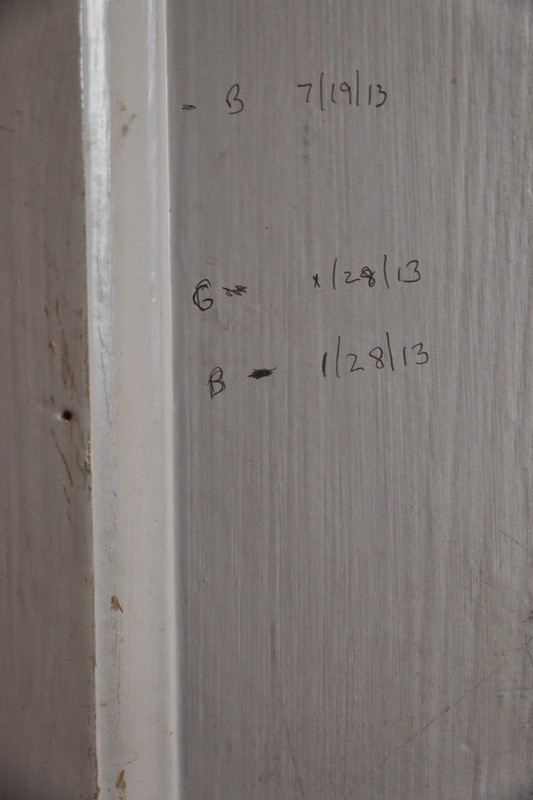 We started these measurements on January 28, 2013. Gavin measured 40" tall. Brian wasn't far behind at 39 5/8". Gavin's first and last measurement. He was dead 76 days later. I went back to that day on my blog - hoping that I had taken a photo of Gavin getting measured that day and posted it. I didn't. But I love what happened that exact day and the next. You can read it here. Gavin had just received his new orthotics - with the Superman logo all over them. He needed them because he was doing so well WALKING... something so many thought he wouldn't do. I couldn't wait to get to the hospital the next day to see his Orthopedic doctor so Gavin could show off. 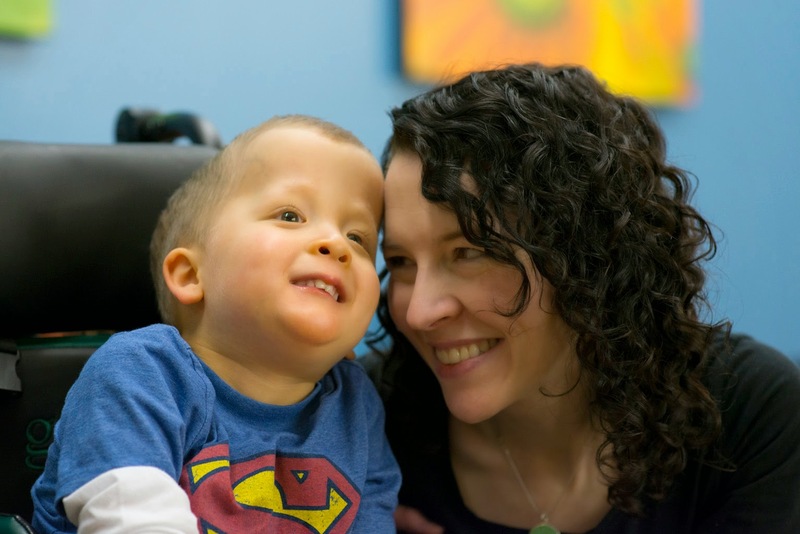 The next morning, in Dr. Gabos' exam room, Gavin walked right across the room to him. Dr. Gabos told me after Gavin died that that exact moment was one he would never forget. A career highlight. He had always said that Gavin had the lowest tone of any baby he had ever seen - to see him walking was just a miracle. I remember the day that Ed measured Gavin for the first time. I felt so proud that he stood there - so tall and sure of himself. This little piece of wood is one of the most valuable pieces of real estate in our home. We love it so... yet, every time we open the basement door - it stops us in our tracks. It makes our stomachs drop. It's the ultimate door stopper. We continue with the tradition - as we do with most things. We marked Brian's height on his fifth birthday, his first as a big brother - and on his first day of Kindergarten. If we ever move, we might try to figure out how to pry this door jamb from the wall. It's funny how it's always the little things that stop me in my tracks - the door jamb, hearing one of his toys as Hope is playing with it, feeding her some of his favorite foods. These things are bittersweet - as I love anything that reminds me of our little boy. As you know, my favorite consignment sale is coming up this week - Just Between Friends. This time around I used a "valet service" that they offer - meaning I collected the things I wanted to sell and handed them over to someone to take care of the pricing, tagging and delivering everything to the sale. I'm so, so grateful that this is offered - and that I took advantage of it! It saved me so much time and energy. There were some things that I didn't want to sell - but didn't want to hold onto - but didn't want to donate to a stranger, either. Like this little ensemble. Brian wore this shirt to his brother's funeral... and the entire outfit again for the big fundraiser I had on the one year anniversary of Gavin's death. It just holds too much 'specialness' - so it will go to a special little guy in our life that may wear it for Easter this year! Going to the Just Between Friends sale is always bittersweet for me. The biggest draw for me each season was the toys. I loved to constantly rotate toys in the playroom to keep things interesting for Gavin. So each sale I would sell toys - and buy new ones - it was almost like a perfect trade! Since Gavin's death, I STILL walk around forgetting and pick things up thinking, "This would be perfect for Gavin during OT..." or PT or Speech or... for fun. But I continue to go with joy in my heart - for Brian and now Hope. We look forward to getting some fresh toys - and unloading ones we once loved. Brian has already given me a list of things he hopes I find: "Magic Tree House" books, Star Wars toys and a tent. I'm going to hope I don't find that tent. He has this crazy idea to try camping. Hate to break it to ya, Brian - but roughing it for me is staying in a motel instead of a hotel. He'll learn. If you're local - or willing to make the trek! - I'd love to see you at the sale this week. It is honestly one of my favorite community events. I've made friends through this sale and look forward to seeing familiar faces twice a year as we all come together to make it a huge success. I really think that this sale is going to be the biggest and best one yet. 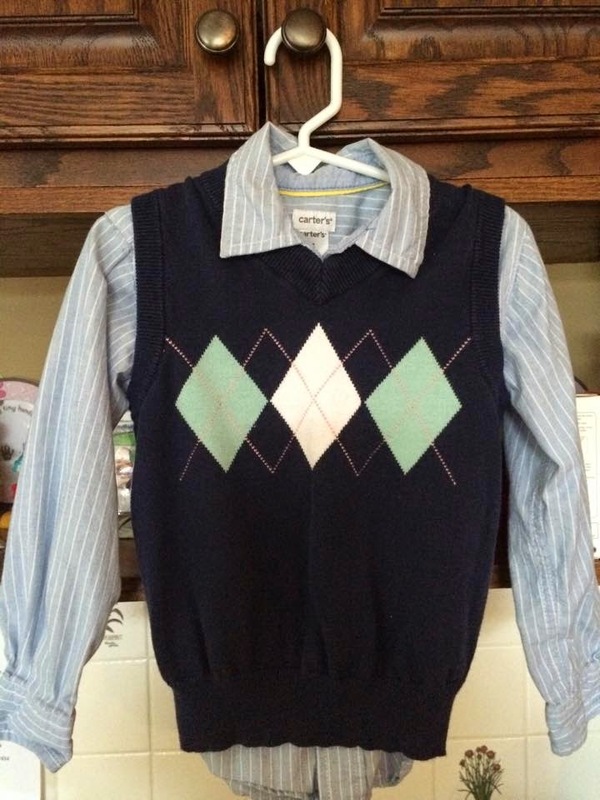 And I'm sure, once again, I'll find the perfect thing for Gavin. And this time, when I do, I'm going to buy it and give it away. Head to the JBF website for more information and how you can get in free.